Long, long ago, the hit TV show That's Incredible hosted one of the very first televised videogame competitions. It was awesome then, and it's just about as awesome now. It was the eighties. Videogames were in their infancy, and the arcade was the place to see and be seen. It was a time when arcade champs, like the three guys taking part in this competition, had groupies. No, seriously, they did. Given that I used to watch That's Incredible religiously, I'm fairly certain I saw this clip when it originally aired. I didn't remember it until I saw it featured in Chasing Ghosts - Beyond the Arcade, an excellent, if somewhat depressing look at the heyday of video arcades. If you ever have the chance to see Chasing Ghosts, make sure you do - it's positively fascinating. In the mean time, just enjoy the amazing (dare I say, incredible) commentary for this competition. Those shirt-jean combo's were an offense to the senses. I cant even imagine it being acceptable in the 80's to wear pastal coloured t-shirts tucked into black jeans belted up to the midriff. More of a Real People fan myself, but that was still pretty damn awesome. Did this have a different title a few minutes ago? Yep. Changed it because "That's Incredible" isn't immediately identifiable for everyone. Oh, man. That makes my arthritis flare up even more than when my students had no idea what The Maltese Falcon was. Did anyone else feel uncomfortable looking at the audience? Who looked uncomfortable watching the show? Most of the audience looked over 40, maybe thats why? Perhaps a little OT, but who else here is a huge fan of King of Kong? Maybe I don't have your, yes, this is a way over used metaphor but, rose-tinted Nostalgia Glasses, but I honestly think this is bizarre. Although, I think it had more to do with the presentation than the actual content. I have the nostalgia glasses, and I assure you, it's incredibly bizarre. Videogames were incredibly huge at the time, but I'm pretty sure the hosts had no idea what the hell they were talking about. Not much has changed, when you think about it. I thought that was pretty good. Amazing how seriously people took, and still take gaming really. 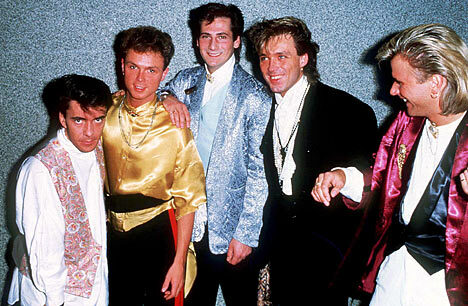 And there is nothing wrong with Spandau Ballet.